Successful teams practice honest and open communication. Everyone is working together in order to improve as a team and within their individual roles. In order to promote this growth, assessments and the feedback that follows provide instructions for athletes. Provide objective non-judgmental feedback so players can master and expand their role. Finding an appropriate role on the team will increase the commitment of diverse players and enhance their overall experience (Boyst, 2009, p. 45). As mature and respectful people, all coaches and players should practice assertive communication. Assertive communication should not be mistaken for aggressive communication (when those who feel insecure attempt to bully and intimidate others or those who lack responsibility complain about what has happened) or passive communication (when people withdraw from the group or choose to remain silent). Both of those types of communication represent an aspect of selfishness that is detrimental to team goals. Assertive communication demands that all team members feel confident and secure about themselves. Coaches must devote enough time to building relationships with players before they can speak freely and frankly with them. Teams and individuals must have a vision of where they would like to be and ask for what they want. Young players must learn communication skills so that they can express themselves with humility and consideration of others. Everyone must take proactive steps to address simmering issues before they boil over and it becomes too late. The conversation is always about the specific behaviour, not the character of the person behind the actions (Harle, 2015). Coaches tell players where they stand and what they need to do to improve. Players listen to the feedback and ask for clarification if uncertain. All team members proactively address potential conflicts in a straightforward manner, instead of via third parties or after the critical moment has passed. Information is non-judgmental and objective, focusing on specific actions and behaviour, not a person. The coach’s door is open to all team members at all times. Meeting players face-to-face and sharing information is another component of a 360º evaluation. It’s important to set a positive tone and emphasize the good things that can happen by sharing information. For a message to get across, it needs to be echoed and repeated by all stakeholders (Krzyzewski, Beyond Basketball, 2006, p. 35). For example, when a player is told about a change they need to make to their passing, hears from teammates how the passes take them out of their shooting motion and see the poor timing on video, they will understand what they need to do. Anyone who has coached adolescent student-athletes understands that anything can happen and sometimes disputes occur that defy belief. It is up to the coach to acknowledge these beliefs as they educate players on how to create non-judgmental objective feedback. Mold the raw emotions into concrete facts supported by evidence and encourage the student-athlete to examine the issue from other perspectives. Taking time to degrief before debriefing may soothe emotions and lead to more productive discourse. Team members often perceive a peer who is working hard and committed to the team more than the coaches because they are with each other 24/7. Players also have a keen sense of chemistry and it’s important to consider their feelings about their teammates. Young athletes may be intense and emotional during games and practices and it is critical that emotions do not boil over. Teenagers need to be coached on how to give feedback to each other, for example by pulling a teammate aside after a drill, speaking to someone who has just subbed out on the bench or calling for a foul line huddle during the game. Player-to-player feedback may escalate if one player criticizes a negative play harshly and the other takes the comments personally. Guide players so that they can speak to each other and get a point across without conflict or embarrassment. It requires effort throughout the season to convince adolescents to speak with a relaxed body language and neutral tone of voice; be patient and acknowledge positive instances of communication when they occur. Chasing improvement and honing performance under pressure requires some frank words. The truth can be hard to hear. It needs to be phrased carefully in order to be well-received and implemented. Athletes need to assimilate information and connect it to what they already know so one coaching style or a climatic half-time speak will not suit all players (Tapscott, 2009, p. 132). Touch base with specific players with a specific goal in mind. For some athletes, linking the skill to their favourite player makes a deeper connection than if it was simply feedback from a coach. Seeing how a hero performs a routine drill or how they address all of the details in their game makes it meaningful to the player. It can be a tool to enhance individual workouts (calling a session for shooting, using screens and dribbling a Rip Hamilton Workout by convince a reluctant player to take part) or tighten up practices (identifying a drill as the “San Antonio Passing Drill” conjures up images of crisp passes and shots taken in rhythm). 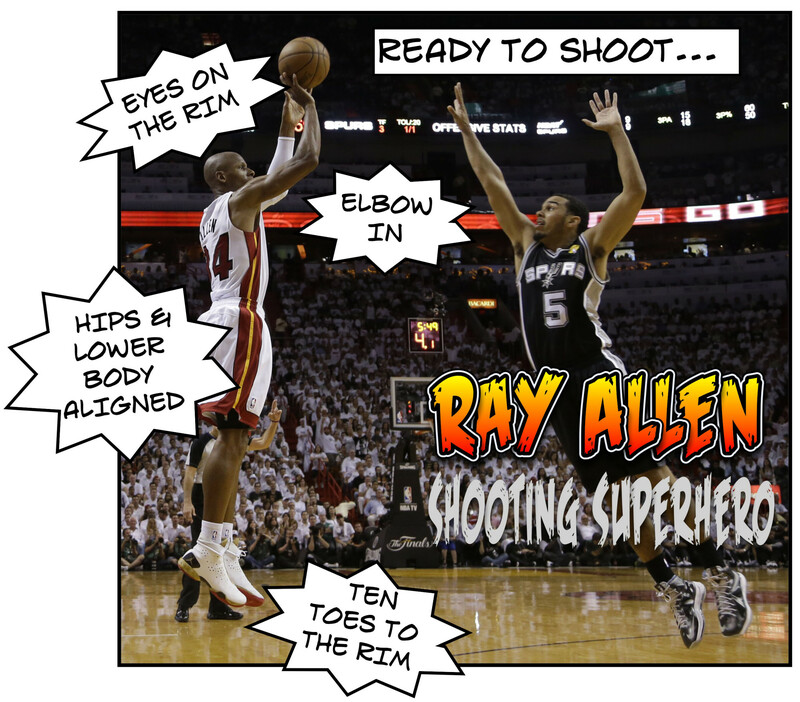 Comic Books: Taking a photo and adding some key teaching points as if it were a comic book creates a dynamic learning aid. It’s important to deliver information promptly as more than half of all youth become impatient waiting for information (Tapscott, 2009). Email can be good for sharing longer thoughts or stringing multiple points (or video clips) together but text messages and Twitter can also serve a purpose. The Atlanta Hawks send players personalized text messages to assist with scheduling and to reinforce key words (Cacciola, 2015). Always model exemplary social media use for young athletes. e-Coaching has become more common because of busy schedules and limited time in the gym. It is very focused and creates a record of the correspondence between coach and athlete. When participating in e-coaching, be aware of some limitations. It may be easy to procrastinate and delay a reply but this can stunt the learning process. Also, there may be less visual cues so supplement text with images or videos . (Janse van Rensburg, Hewitt, & Bussin, 2013, p. 2). Also, because tone of voice and body language are missing from text communication, always be very positive and express belief in the athlete. Virtual Encouragement: Coaches such as John Calipari have experienced success building their program and encouraging the team using Twitter. Players will have their own preferences regarding communication. Firstly, respectful communication must be private and discreet if both parties are to speak candidly. Secondly, players will prefer their own communication style, which should be considered by the coach. Throughout the year – but particularly at the start and end of the season – it is imperative to meet with players to ensure that everyone is on the same page and buying in. The session at the start of the season permits both parties to share expectations and the one at the conclusion pertains to long-term goals and individualized improvement plans for the off-season. No matter what the agenda of the meeting, both player and coach should be present in the moment. Dean Smith would always hold his calls when he met with a North Carolina player. Times have changed but meetings are neither the time nor the place for personalized electronic device (presenting video or another visual aid on a tablet is an exception). Well-organized and succinct meeting prepare athletes for these situations later in life. Well-organized and succinct meeting prepare athletes for these situations later in life. I find that meetings are unproductive and tedious without an agenda. Concisely stating what will be discussed and why it is important and summarizing the meeting and the next steps will lead to constructive action. Requesting that players evaluate themselves (areas of strength and areas of improvement) or teammates (the best shooter/ballhandler/rebounder, players who should be starting, players who are unappreciated) before the meeting can lead to productive discussions. Players could also be asked about specific issues (handling pressure, offensive sets, free throw shooting, end of game situations) and bring potential solutions to a meeting. Prompting players to critically consider themselves and their teammates will promote understanding of the game and focus their efforts to improve. Also player engagement and accountability will increase, promoting critical life skills. Taking the Last Shot: Red Auerbach chose not diagram a play in the huddle but ask a player for a suggestion – not necessarily a star like Bill Russell or Bob Cousy but possibly a role player. He felt that this would promote engagement in the play that ensued (Pitino, 2014, p. 153). At the start of his first season with the New Jersey Nets, John Calipari asked each player where they wanted the ball for a shot at the end of the game, hoping to eliminate excuses (Calipari, 2014, p. 53). Just like improvement never stops, neither does the communication behind it. Feedback must be continuous and progressive during the season. Rather than stopping the entire practice or drill to correct a single player, pull them out of the drill and provide succinct comments. Let them work on it and follow-up. As players develop, they will learn what a successful repetition feels like and correct themselves. Sports should be athlete-centered, not coach-centered. The coach-player relationship does not cease at the end of the season. A coach remains an influential mentor, especially regarding lessons about life and leadership. Helping players throughout their careers also benefits the program because alumni are a valuable resource. They communicate with current players by modelling the way during pick-up games or by reinforcing the coach’s message. Dean Smith remained in contact with all North Carolina lettermen, remembering details about their lives and their families. Smith would contact professional players on the eve of their seasons and remind them that he would be watching as they stepped on the court. After his death, Smith willed two hundred dollars to each former player, telling them that he cared about them and urging them to have a “dinner out” on him (Rovell, 2015). Small nudges, instead of forcing drastic changes, can initiate, modify and terminate adolescent behaviour, including decision-making and personal health. Addressing an issue does not demand that a coach communicate everything at one time. Gradually making suggestions, followed by repetitions, will help youth form better habits over the long-term. Environmental nudges – such as a positive example or a poster – can be as effective as spoken words (Dansereau, Knight, & Flynn, 2013, p. 281). When young players enter the game, a coach can provide a simple task or objective. When they exit, a member of the coaching staff should provide a quick word to let them know how they performed. The best prepared speech or meticulously crafted words are meaningless if they are not understood. Sometimes, a slogan or keyword is as effective as a longer explanation. Timeouts during games or conversations after pulling a player out of a line in practice are so brief that being clear and concise is paramount. Players who are leaders are responsible for telling the coach if the message was not received or whether there are any lingering questions (Krzyzewski, Beyond Basketball, 2006, p. 37). Information must be conveyed in a manner that suits the athletes. Verbal instructions may suffice for some meetings but others may require that visual demonstrations are prepared ahead of time (video is ideal but images could serve as substitutes if required) or that a large enough space is reserved to accommodate physical practice and repetition. Video clips should be positive, illustrating a player or team performing a skill or concept correctly. Clips could feature a well-known player/term or footage from a recent game or practice. Step-Back Jumper: Michael Jordan demonstrates how to use his shoulder to attack the waist of a defender in order to create room. Drive & Kick: The San Antonio Spurs demonstrate how to space the floor and move as dribble penetration occurs in order to get an open shot. The aim is to convince players that they are capable of achieving the goals that they have established or show that they are already doing so and should feel confident. Clearly, the clips mean to highlight process of executing the skill or concept, not the outcome of doing so at the professional level, since this is outside everyone’s locus of control at the moment. Coaches must plan how they will communicate during the year. Define the terminology that will be used and be consistent (for screen and roll defense, will you use Ice, Down or Blue?). Even if it takes time time at the beginning of the season to plan how communication will take place is well worth the effort (Krzyzewski, The Gold Standard, 2009, p. 106). Relying on a core group of slogans or gestures will keep the team on-task during critical junctures. Teams must also establish their values and the roles that each player will play. This can be decided in collaboration with team leaders and individual athletes. All communication will flow within this framework. The communication will exemplify to team’s values and help a player identify his role, own it and expand it. Boyst, J. P. (2009). An Examination of Sport Commitment in Collegiate Athletes. Retrieved March 9, 2015, from The University of North Carolina at Greensboro: http://libres.uncg.edu/ir/uncg/f/Boyst_uncg_0154M_10149.pdf. Cacciola, S. (2015, March 13). Key to Hawks’ Team Play: Nourish the Individual. Retrieved March 26, 2015, from New York Times: http://www.nytimes.com/2015/03/15/sports/basketball/secret-to-atlanta-hawks-team-play-nourish-the-individual.html. Dansereau, D. F., Knight, D. K., & Flynn, P. M. (2013, August). Improving Adolescent Judgment and Decision Making. Professional Psychology: Research and Practice, 44(4), 274-282. Harle, S. (2015, Winter). Why Coaches Need to Tell the Truth. Retrieved March 11, 2015, from Coaches Plan: http://www.coachesplan-digital.com/coachesplan/Winter_2015#pg13. Janse van Rensburg, L., Hewitt, M., & Bussin, M. (2013, June). An Integrated Coaching Model in the Context of E-Coaching. Retrieved March 26, 2015, from Leon Janse van Rensburg: http://www.academia.edu/4439523/An_Integrated_Coaching_Model_in_the_Context_of_E-Coaching. Pitino, R. (2014). The One-Day Contract. New York City: St. Martin’s Griffin. Rovell, D. (2015, March 26). Dean Smith remembers players in will. Retrieved March 26, 2015, from ESPN.com: http://espn.go.com/mens-college-basketball/story/_/id/12563125/former-north-carolina-tar-heels-coach-dean-smith-leaves-200-letterman. Stein, A. & Bradley, A. (2015, March 19). How to coach the un-coachable. Hardwood Hustle. Podcast retrieved from http://itunes.apple.com/ca/podcast/ep.-134-how-to-coach-coachable/id658885222?i=337995193. Tapscott, D. (2009). Grown Up Digital. Toronto: McGraw-Hill.